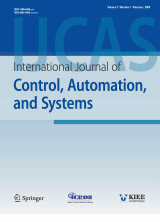 Abstract : "In this paper, we address the control problem of a Quadrotor Aerial Vehicle (QAV) in the presence of the input constraints. For this purpose, a separation principle is applied in the control design. The QAV model is decoupled and constructed as a cascaded structure to handle its underactuated property. By imposing the constraints on the orientation angles, we show that the QAV will be never overturned. Then, a combination of the backstepping method, barrier Lyapunov and saturation functions is used in the control design for each subsystem to deal with both input and output constraints. Our design renders the cascaded system of the QAV into the form in which an Input-to-State Stable (ISS) subsystem is driven by an asymptotic subsystem, and hence the stability of the overall cascaded system of the QAV is ensured. In addition, the tracking errors are guaranteed to converge to the origin. Simulation results are provided to illustrate the effectiveness of the proposed control. " Keyword : Bounded control, input saturation, quadrotor aerial vehicle, trajectory tracking.